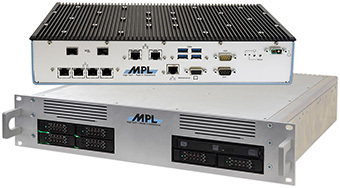 If you are looking for a Xeon Server that is "Rugged by Design", fanless, and meets the various standards needed for applications in Transportation, Railway, Maritime, or Defense, then the MXCS from MPL is the solution you need to take a closer look. The market is full with Xeon 19" Rack Servers, even Industrial or MIL spec server are presented on the web. If one goes to the inside information of the various offers, then the limitations are quickly visible. Hardly any of those tough Xeon servers come without fan or can be operated at an extended temperature. Or they are limited in the numbers of CPU cores or amount of RAM. The MXCS from MPL offers real server processing power, maximum memory capacity, and ultimate flexibility (M-COTS). The MXCS (MPL Xeon Class Server) has been designed from scratch based on MPL's design experience since 1985, with the aim to create a rugged fanless multi core server to be used in tough and unfriendly environments. • Is designed to meet most rugged requirements in transport, defense as well as any other tough environment or application. With the MXCS design you do not need to workout compromises, it simply fulfills all your needs. The MXCS Xeon server solution is passively conductive cooled and designed for an environment of -20°C to +60°C. The conductive cooling concept can be adapted to its installation place or add-ons. On request it can even be equipped with a failure protected ventilation array, without blowing air and dust over the electronics. The rugged Xeon server is available in a compact enclosure for wall or desktop mounting, as a 2U 19" rack solution, or a sealed IP67 MIL housing with MIL-38999 connectors. • Optional TPM module, with Intel chip or FPGA.